Let the beach bums and hordes of families keep the Jersey Shore, visitors that find themselves in New Jersey and in need of something that is actually physically demanding will want to pay a visit to its best kept secret - the Peanut Leap Trail. This hidden gem sits right on the border of New York and New Jersey in the Palisades Interstate Park. This rugged park is filled with endless rock climbing, scrambles and a steep climb from the shoreline to the top of cliffs. It shows off a side of New Jersey that most would never expect and only a few have seen. The Peanut Leap Trail is actually somewhat difficult to figure out. Trails in the Palisades are named both with trail names and trail letters (Trail A, B, C, ect.). The Peanut Trail is named for the eponymous waterfall that it leads to and actually spans a number of different trails along the way. 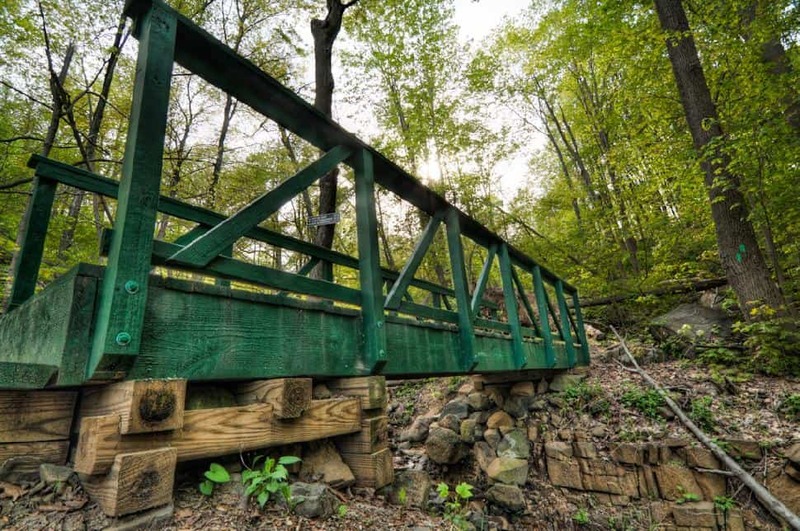 From the nearest town of Alpine, hikers should head east out of town on Closter Dock Road and take a left onto US-9W N. After just under a mile, take a right off the highway onto Alpine Approach Road that leads right into the park's main parking lot. After parking, the first trailhead for Peanut Leap will be located back down the main road a few feet. It is labeled Trail E / The Long Trail. Trail E wastes no time warming hikers up. It heads straight up into the forest winding around huge boulders with the Hudson River visible where the trees thin out slightly. After roughly half a mile in, the trail gives its first big peek at some of the wonderful views that will be showcases along the way. The trails stops and a sheer rock cliff looks out over the Hudson and over into Yonkers beyond. Be careful not to get too foolish near the edge, though. There are no railings and it is a bit of a drop. To continue on, take the staircase down which leads to two bridges over two steams in quick succession. They're nothing special; the streams could easily be hopped across even without the little bridges. However, this section of the trail tends to be a little overgrown in places, so hikers may have to comb their way through the brush. Upon reaching an oddly bent warning sign, hikers know the trail is about to get fun. The warning sign tells of a difficult scramble with steep ascents ahead and advises sturdy footwear. It also suggests that only experienced hikers attempt it, but it is being a little bit dramatic on that point, just be careful to not sprain an ankle. At the warning sign, take a right and continue down the path. Heading down a steep staircase, visitors are given an early reward before all the hard work by leading to the beautiful Peanut Leap Waterfall. 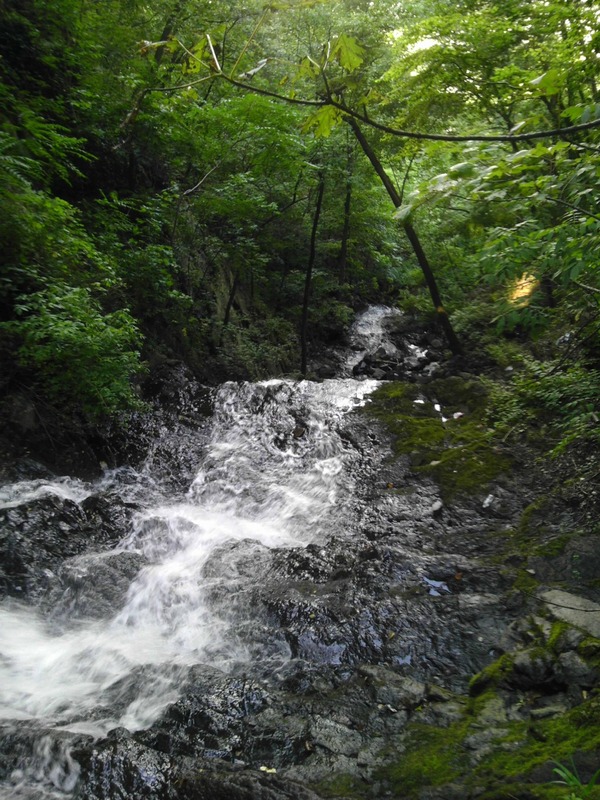 This is one trail visitors may want to take after heavy rain or early in the spring when the waterfall is particularly vivacious with rain water or spring snow melt as it gushes into the Hudson. The waterfall is as good a place as any to enjoy a break, but when hikers are ready to continue on they should hang a right and follow the shoreline. After a few short minutes, they will come face to face with what the warning sign was warning of - the Giant Stairs. These giant rock scrambles actually do resemble giant stairs. Hikers climb medium to large sized boulders up to a relatively flat outlook that looks out over the Hudson, and then they repeat the process for three other giant steps. It may seem pretty easy when standing at the bottom looking up, but by the fourth step, those who didn't stop for a break are sure to be huffing and puffing. It's worth noting that from the top of the fourth step visitors can see the cliff they stood at where they started the hike. For those visiting due the warmer months, this area is a particularly vibrant meadow filled with daisies and other wildflowers. Following the trail through the meadow, as hikers dip back into the forest, they will be faced with the Forest View Trail / Trail A. For those who thought the Giant Stairs were challenging, the ascent on the Forest View Trail gives the stairs a solid run. Once the Peanut Leap Trail gets going, it doesn't stop. The Forest View Trail traces what feels like a small mountain. It trails up at a steep incline. Sometimes there are stairs carved into the trail to help the ascent, sometimes there is not and hikers just have to deal with it. While the Peanut Leap Waterfall is great to view after a heavy rain, this section of the trail is torture to hike when it's wet. As hikers reach a green bridge and think the ascent is over, think again. Have a nice rest on the bridge looking at the stream far below. It is still another half a mile of inclined hiking as visitors climb back up towards the parking lot. This is definitely one of those trails where hikers never remember the descent being as dramatic as the climb back up. Eventually, the trail ends at the US-9W. Visitors will need to cross the road and will pass the beginning trailhead again as they return to the parking lot. At this point, for those who feel like having a seat, pay a visit to the visitor's center. The visitor's center is nothing particularly special, but it does have a nice view out over the river, water fountains and benches to rest on. After such a strenuous hike, what more could anyone want?